D and I are visiting family in Louisiana and Texas this week. It feels so weird to travel on the cusp of RSV season. This time last year we had already been in strict isolation for a month because he wasn’t gaining weight and hernia surgery was looming. Yesterday, D got to meet his only first cousin. She’s 4, and they are both only children. They played together very well despite the age difference. It’s really hard for me to live so far away. I’ve always been close to my parents, sister & brother. Then we grew up in a small town so there are other folks I miss tons as well. In addition to the emotional cousin meet, we had to go through some things of my granny’s. Another reminder of NICU days. She passed away 2 weeks before D was born. Today was an ordinary day. 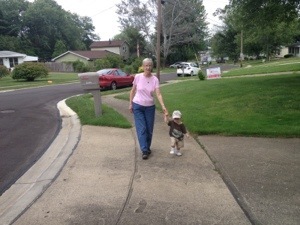 Great Grandma came over and we took a walk. Drake wore a baseball hat without freaking out for the first time. 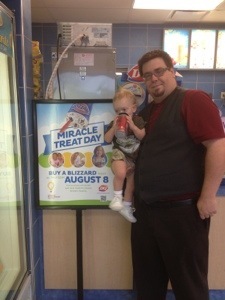 We went and had Blizzards for miracle treat day! Our local CMN hospital is Cincinnati Children’s. 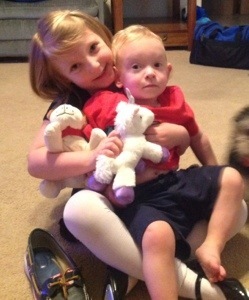 Home to his NICU neonatologists and his follow up specialists. I love living a miracle. Every. Day. Never again will I post BEFORE we go to an assessment or appointment. So we have the good and the not so good. 1. Low muscle tone and hyper flexible joints are holding back his gross motor skills like walking. The team also thinks its causing pain/discomfort when sitting still, so it’s why he has trouble focusing on things like eating. Suggested: Get enrolled in Early Intervention and if he’s not walking solo in 3 months (18 actual/16 adj) we need to consider AFO options after a consult with PT. 2. His verbal skills are awesome. 11 words and going. 3. His weight/height are on his personal curve and increasing at a rate that pleased the neonatologist. 4. They want him in the follow up clinic program until at least 2 actual. Next appointment in 6 months. 5. We toured his future preschool today. He has to be off the bottle completely and walking independently for the half time 18-24 mo class. The will give him his extra calorie formula in a cup as needed and have cared for preemies previously. Plus, Asst. Director is a family friend. So now to set up the EI evaluation, and hope. In a few hours, I take Drake for his second NICU follow up clinic. There’s a chance that this time he will be discharged from it. I don’t know whether to feel happy he’s doing so much better than last November or scared that if something develops over the next year it will be that much harder to get him help. I think I just need to learn to not borrow trouble. I’m hoping since we agreed to be part of a study last visit that they’ll bring him back one more time at 2. We’ll start with a hearing test. He wasn’t sitting up on his own yet at the last appointment, so they couldn’t do part of the test. He was 8 months actual/6 adjusted. The last visit was just 3 weeks after his hernia repair surgery, and he really took off in December developmentally. We still struggle with weight gain. He was 17.8 lbs at his 15 month wellness a few weeks ago. My biggest fear is that he’ll get sick and lose the hard fought ounces. He has some foods he likes, and is still on 32 ounces of 26 cal/oz formula a day. At the slightest bit of discomfort from teething or any kind of overstimulation, he just stops eating altogether. Maybe I can get the clinic neonatologist and therapists to give me some advice about combating that. It doesn’t seem to concern his pediatrician. I am very interested to see what they have to say about his hypotonia, and whether that is affecting his walking/lack of walking. He’s got several words he uses sporadically. I think he’s going to do very well on most of the gross and fine motor stuff. I have some anxiety over this appointment, but my worry and anxiety has been a lot more manageable since RSV isolation ended. At the November appointment, I really hated both being in a hospital and the fact that he was playing with toys other kids had touched. Yuck! I’m just really thankful I was able to get him down for an early nap. He was half asleep last time, and very angry by the end of the clinic. 6/3 was our scary anniversary. The day he stopped breathing and went blue. I went in the ambulance in a pair of jeans, a nightgown, and a pair of flip flops. I was weirdly calm. The paramedic was freaking out because he expected a 3 month old not a 7 lb newborn sized baby. None of the oxygen masks in the ambulance were small enough. The EMT and paramedic were surprised that I wasn’t freaking out on them. D was very prone to A&B’s in the NICU. I had seen that before just not without a monitor to show me his saturation level. We are so lucky that it was GERD, that he was fine, and that that was our worst day.